It was a cool, rainy September day yesterday and I was definitely feeling some good ‘ole comfort food… So I decided to make some chicken noodle soup. Here’s the recipe, enjoy! Note: Normally I would make my own chicken stock but unfortunately I didn’t think far enough in advance and there wasn’t enough time. At some point in the near future I will post how to make your own stock, but in a pinch store bought stock serves the purpose, though it’s not as rich in flavor. In a large pot heat the olive oil on medium heat, add the onion, garlic, celery and carrots and season with 1/2tsp each of salt, pepper and garlic powder. Cook on medium for 3 minutes to let the vegetables sweat. Increase the heat to high, add the chicken thighs and once again season with 1/2tsp each of salt, pepper and garlic powder, cook for 5 minutes turning the chicken halfway through. Still on high heat add the white wine, allow to reduce by half. Add the chicken stock and water, along with 1tsp each of salt, pepper and garlic powder. Bring to a boil then reduce the heat to low and simmer for two hours, stirring periodically. Towards the end of the two hours the chicken should break up while stirring. After two hours it’s time to make the slurry. In a bowl whisk together 3tbsp of cornstarch and 3tbsp of cold chicken stock and whisk vigorously. The slurry is used to thicken the soup. Add the slurry to the soup and increase the heat to high. Bring the soup to a boil and maintain it for 3 minutes to burn off the cornstarch flavor from the slurry, then reduce the heat back to low. Add the egg noodles and chopped parsley, simmer for 20 minutes, stirring periodically. Add the unsalted butter and stir until melted. Taste to make sure the soup is seasoned to your liking… and that’s it, you’re done. Serve it up. 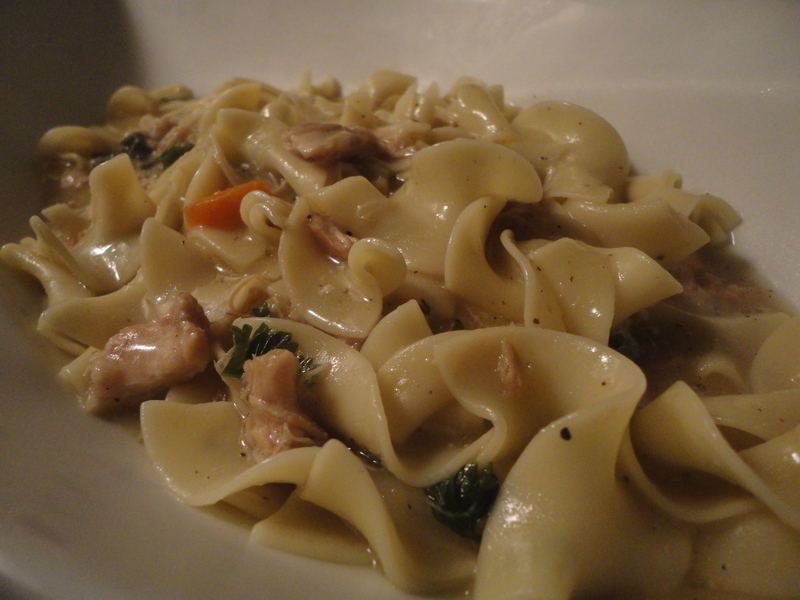 Tags: chicken noodle soup, comfort food, homemade, perfect pairings, perfect pairings at home, soup. Bookmark the permalink.